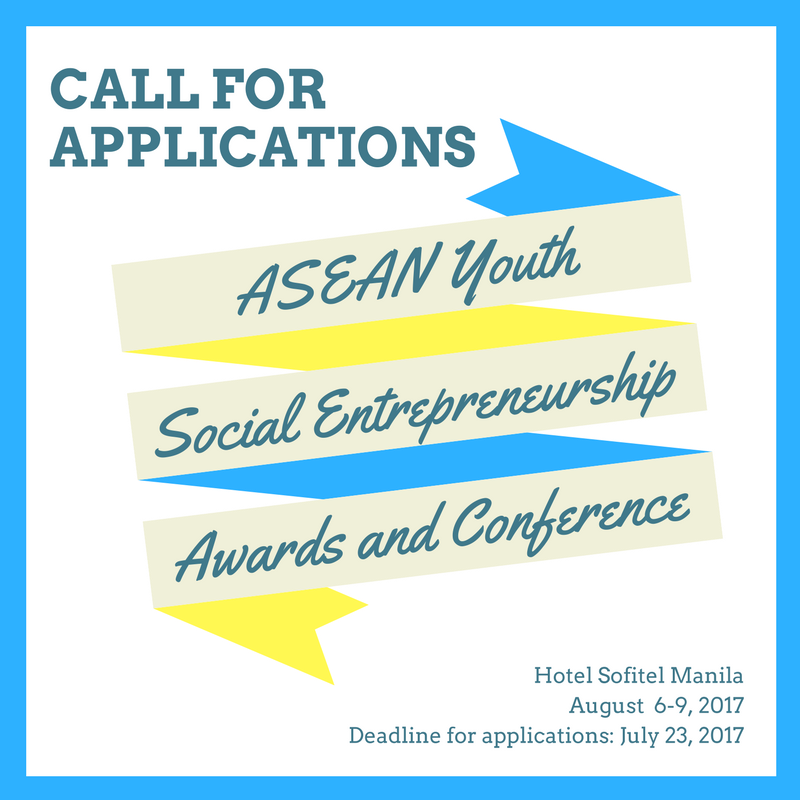 The National Youth Commission, in cooperation with the ASEAN Secretariat and the Department of Foreign Affairs, is hosting the first ASEAN Youth Social Entrepreneurship Awards and Conference at Hotel Sofitel Manila on August 6-9, 2017. The conference aims to gather youth leaders and social entrepreneurs to share their best practices as well as their relevant success stories. Part of the conference is the 2017 ASEAN Youth Social Entrepreneurship Awards, the awards and recognition program of young social entrepreneurs from the ASEAN Member States whose initiatives brought about positive changes in their respective communities. NYC is sending 17 delegates to the event. • Delegates will shoulder their travel expenses from their residence (province) to Hotel Sofitel and back. • NYC will take care of the delegates’ food and accommodation during the conference. • Participants of NYC-coordinated international programs from July 6, 2015 – present whose airfare was shouldered by the participants and whose accommodation and meals were paid by the organizer. • Previous NYC International Programs’ Beneficiaries who have not submitted or accomplished the required post-program documents or volunteer work. • FOR ONLINE APPLICATIONS: Submit documents to nyc.internationalprograms@gmail.com (with Subject Heading: APPLICATION FOR AYSEA). • FOR PERSONAL APPLICATIONS: Submit your documents to NATIONAL YOUTH COMMISSION, THE INTERNATIONAL PROGRAMS UNIT, 3rd Floor West Insula Building, West Avenue, Quezon City, 1105. • FOR SUBMISSION THRU COURIER: Send your documents to: NATIONAL YOUTH COMMISSION, THE INTERNATIONAL PROGRAMS UNIT, 3rd Floor West Insula Building, West Avenue, Quezon City, 1105. • Deadline for submission is 12 MN / July 23, 2017. • Please send all queries to nyc.internationalprograms@gmail.com with subject heading “Query: AYSEA”. • Please get in touch with the NYC International Programs Secretariat through Ms Sarah Grutas or Mr. Mark Fernandez at telephone numbers (02) 4162833.